Trump’s Ignoring Latin America. We Do that at Our Peril. Lessons from World War II. We need to remember that many of these countries helped lead the way to the establishment of republican government. What Would a President Hillary Clinton Do to Help Democracy in Latin America? We can’t be sure, but her track record suggests she’d favor military solutions at the expense of democracy in a crisis. The Nation was far ahead of the mainstream media in recognizing new trends. 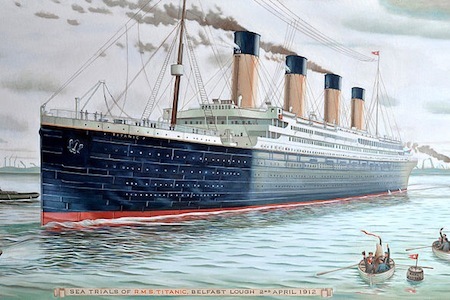 In the slightly less than a hundred years from 1898 to 1994, the U.S. government has intervened successfully to change governments in Latin America a total of at least 41 times. Latin America of late has shown a maturity without precedent in its turbulent history. Rather than relying on our hopeless forty-fourth president and an even more hopeless Republican-controlled Congress, citizen groups need to mobilize together to oppose the waste of their hard earned taxpayer dollars in the War on Drugs. In Bolivar, Ms. Arana recounts Bolivar’s bloody military campaigns and forays into the turbulent and frustrating politics of the new republics, and she also presents a striking portrait of the times and the many contradictions and foibles of the Great Liberator -- a passionate embodiment of the Enlightenment who was addicted to gambling, glory, and women. Marie Arana, a journalist, novelist and adviser to the librarian of Congress, is the author, most recently, of “Bolívar: American Liberator,” and a guest columnist.Can you name an American founder whose name is shouted in the streets, whose legacy inspires fanatical worship, whose image is used to bolster ideals not his own, whose mantle is claimed by both left and right? There is no Washington party, no Jeffersonian republic. No one runs for president in Madison’s name. But in Latin America, as the Venezuelan election on Sunday reminded us, the question is easy, and the answer is Simón Bolívar. 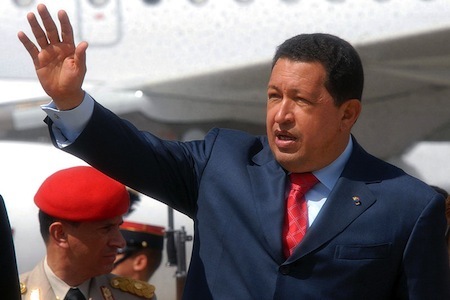 Hugo Chavez during a state visit to Guatemala. Credit: Agência Brasil.Few would contest that Hugo Chávez had a penchant for fiery rhetoric. Less understood is the role that rhetoric played in turning Latin America from a region where the United States held unparalleled sway when he first took office in 1999, to one where leftist governments of varied stripes now assert unprecedented autonomy vis-à-vis their neighbor to the north. 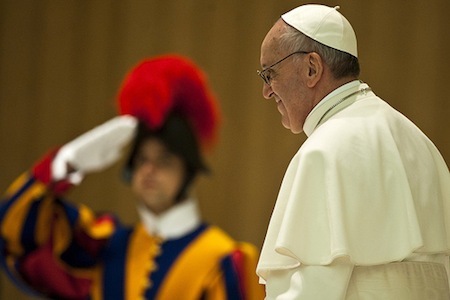 A Pope of Firsts, But Will Francis Actually Change the Vatican? Pope Francis at the Vatican. Credit: Flickr/mazur.Pope Francis, the former Cardinal Bergoglio of Argentina, was installed on the feast day of St. Joseph as the 266th pope over the Holy Roman Catholic Church. For a religious historian like myself, his appointment has been a dizzying number of firsts: the first Jesuit to become pope, the first pope in the modern era to succeed a pope, Benedict XVI, who is still alive, the first pope from Latin America, and the first to take the name of Francis.While all of these firsts are important, they also must pass through the prism of the Jesuits' history, the Catholic Church’s history in Latin America, and by Bergogolio’s own history in Argentina during the Dirty War. While Pope Francis’s ascension to the petrine throne may signal some change in the manner in which the papacy is lived out in front of the world, will it engender real, substantive changes in the Catholic Church, and its worldwide following? Pope Francis. 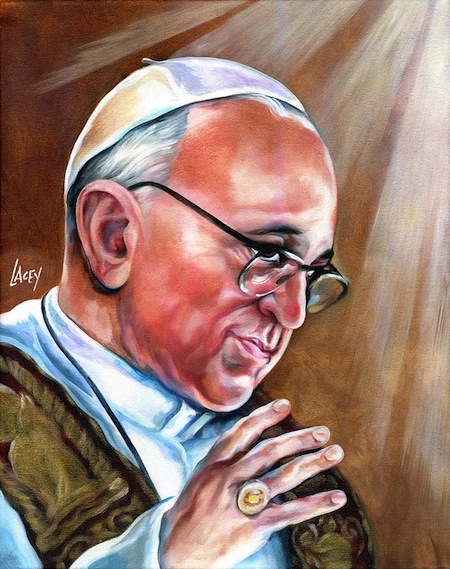 Painting by Dan Lacey via Flickr.At 8:12 p.m. on Wednesday, March 13, Cardinal Jean-Louis Tauran announced from the famed loggia of St. Peter’s Basilica “Habemus Papem,” “We have a pope.” Within minutes, as the world's 1.2 billion Catholics and curious onlookers worldwide processed the announcement that Cardinal Jorge Mario Bergoglio of Buenos Aires had been elected the 266th pope, Latin Americans and U.S. Latinos exclaimed “Tenemos un Papa,” “We have a pope!” Or, as the Huffington Post announced, “The Holy Sí! Argentine Pope.” What does it mean to have a Latin American pope?